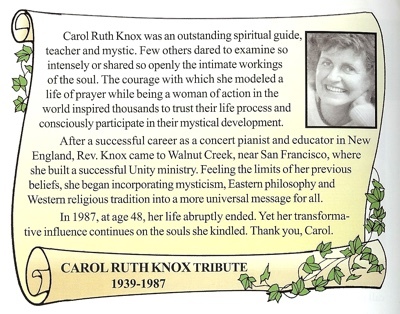 Carol Ruth Knox has left us two short writings (about 80 pages each) that explore Unity and mysticism. Prayer of the Heart (written between 1977 and 1983) is a compilation of her ideas on prayer, which she describes as an art form which gradually develops to become a constant presence in one's life. She combines Unity's teachings on the silence and stillness with classic texts on prayer, such as the 19th century Christian classic The Way of the Pilgrim and Thomas Merton's The Solitary Life, to lead us to a state she calls The Flame of the Heart. Besides leading us to a deeper understanding of our own interior life, she has left a unique and refreshing contribution to western spirituality in the name of Unity. 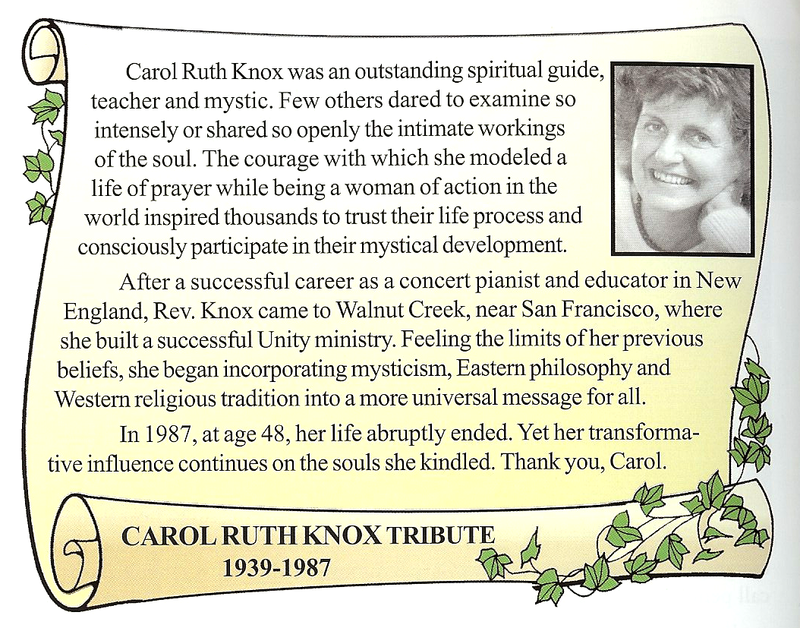 Carol Ruth Knox's Unity - The Teachings and Principles builds on The Prayer of the Heart to provide an introduction and overview of Unity from the perspective of mystic Christianity. What she has written is personal (filled with many of her own life stories), powerful (the sort of thing that gets men out of gutters) and candid (the best answer I've ever read to the charge "Is Unity a cult?"). A third resource from Carol Ruth Knox, her Lay Ministry Student Manual, is a practical outline for fostering and empowering lay ministry in a Unity congregation. After arriving at Unity of Walnut Creek she built one of the largest Unity ministries in the United States. This outline provides an insight into how she was able to manage that growth. Ruth Carol Knox was obviously one of the most innovative ministers produced by Unity. We need to learn from her. The materials she has left us can help guide Unity to a richer spiritual tradition and to building more loving, vibrant churches. Ruth Carol Knox was educated at Tufts University where she earned a Bachelor of Arts in English and Music and an M.A. in Musicology. She was ordained as a Unity Minister in 1970, and in 1983 completed her Ph.D. at the California Institute of Integral Studies in Intercultural Philosophy and Religion. 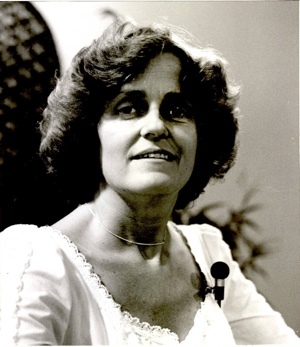 Her entire ministry was at Unity of Walnut Creek, California, beginning after her ordination in 1970 and tragically ending in 1987 at the hands of a deranged person. The details of her work at Unity Walnut Creek may be read online at the Unity of Walnut Creek timeline and it's link to the detailed history of the Carol Ruth Knox years. The detailed history of the Carol Knox years is a wonderful read. I highly recommend that you download it, read it and share it with other leaders in your church. Unity of Walnut Creek has a podcast page for Carol Ruth Knox. There is also a Carol Ruth Knox Facebook Page and several of her talks are uploaded to Youtube. After a successful career as a concert pianist and educator in New England, Rev. Knox came to Walnut Creek, near San Francisco, where she built a successful Unity ministry. Feeling the limits of her previous beliefs, she began incorporating mysticism, Eastern philosophy and Western religious tradition into a more universal message for all. In 1987, at age 48, her life abruptly ended. Yet her transformative influence continues on the souls she kindled. Thank you, Carol. If you have been inspired by the work and life of Carol Ruth Knox, then why not consider making an offering to the church that supported her ministry, Unity of Walnut Creek?